For the true hunter, the pursuit of game is everything. Elk hunting tips can greatly increase the pleasure of that pursuit. Thanks to the elk’s innate ability for sensing danger, they are one of the most challenging objects of pursuit for a huntsman. Although their massive size would seem to make them easy targets, it is not uncommon for many hunters filled with the anticipation of a kill to find they have unwittingly been given the slip not just for the second time, but for the third or fourth in a single day of hunting. Before setting out, wise hunters know it’s best to educate themselves on every aspect, brushing up on as much information as possible, including current tips, tricks and advice. Of all the most important elk hunting tips, planning and preparedness heads the very top of the list. The vast majority of seasoned hunters will agree that planning ahead can be the difference between the trip of a lifetime and complete disaster. The challenge of the hunt lies in part with the unpredictability of the outdoors. While it is folly to always expect something to go wrong, the sport of hunting is one place where safety rules and it is always better to be safe than sorry. The use of firearms, the lack of direct access to medical services and the remote location in which elk hunting can take place needs that any and all precautions that can be taken, should. When it comes to other elk hunting tips, the study of behavior and the use of calls is a major point of discussion. Failing to use a call correctly can have a negative effect on the success of a hunt. While some debate the use of inexpensive calls over higher priced models, others contend that price is nothing when talent is present. There are many pieces of advice on what type of call to use based on whether one is hunting a bull or cow. These calls are based on gurgles, mews and other sounds indicative of elk behavior in a herd. As many hunters know, certain calls made during the rut have more of an effect than any other time. 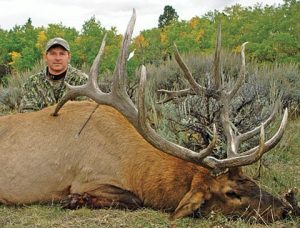 Next on the list of elk hunting tips usually has to do with choosing an effective big game cartridge. Elk are large animals that have a tough hide and massive internal organs. While every hunter has his or her preference, there is no absolute single brand that works better than others. Big game ammunition has a specific purpose and some types are even made to be effective exclusively when shooting at big game over long distances. It is important that the choice of cartridge be the type that can be shot time and again with little or no problem, allowing a good amount of handling and control.